Our Final Warehouse Sale is in its final days, with EVERY single stamp marked 40% off...including this 2x1 set of glasses (designed to fit my free printable alpaca). The mini sunnies sold out within minutes of my previous post, so be sure to add this little guy to your cart ASAP if you want to snag it! P.S. This medium glasses stamp is on sale right now for less than $9! Grab it before I sell out - we won't be making more! No coupon code necessary. Here it is :: a mini coloring kit! There are so many fun things you can fit in these things—baby sunglasses, a whistle, candy, erasers, jewelry, gift cards—why not skip the paper wrapping altogether and gift your tiny items in a cute, reusable bag! To celebrate the re-opening of our shop, I designed a new, limited-edition "Love Letters" stamp set with this DIY Valentine in mind. With three simple cuts, you can create a mailbox that really opens! As always, the printable above is free for personal use only and may not be redistributed, copied, or sold. Please share the project with a link to this post. Tag us on Instagram with @prettypeaspaperie, #prettypeaspaperie. Stamp your mini envelopes onto a separate piece of paper (or label paper, if you have it), then cut them out. Since each envelope is different, you can use a unique color for each one if you have multiple stamp pads. Glue or stick the mini envelopes onto your card. OPTIONAL: hole-punch hearts and glue 'em on, or add tiny white dots with your gel pen. Write a personal note on the back and mail to someone you love! Print the second page of the PDF—the one with the envelopes—onto a separate piece of paper (or label paper, if you have it), then cut out as many as you want. Note :: Each 8.5" x 11" sheet fits 56 mini envelopes and 6 jumbo envelopes. 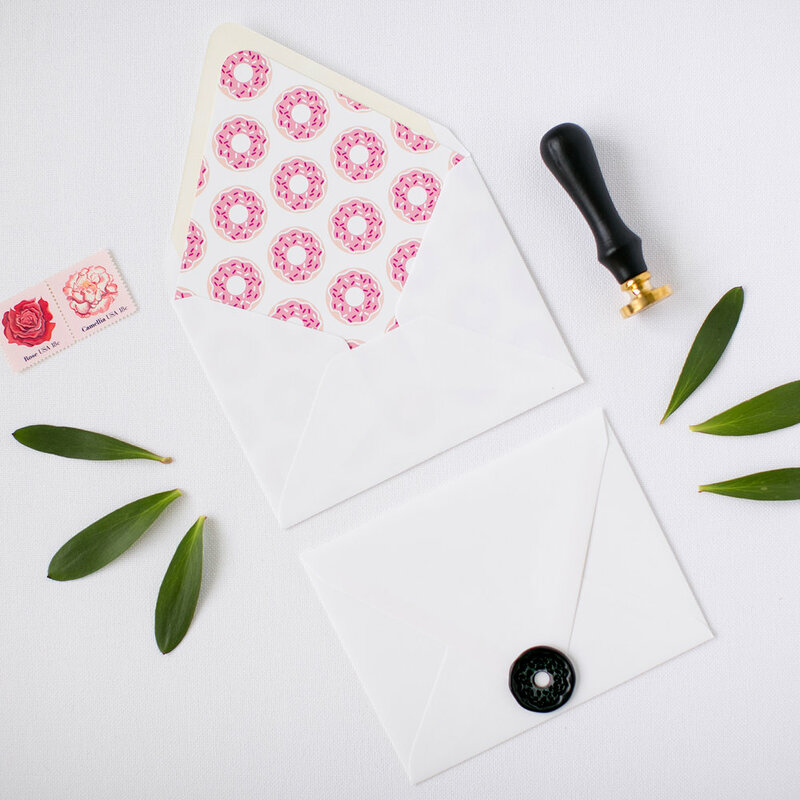 Envelope liners are the perfect way to spruce up your snail mail, and today I'm sharing 6 free designs that you can print from home! This philodendron pattern paired with a coral envelope makes me want to go on vacation. 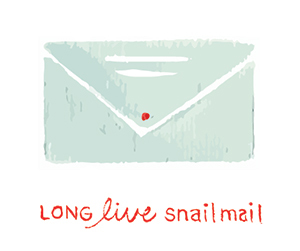 These little snails are doing a fine job of delivering their mail. Cacti can look so sophisticated in black, white, and blush. Donut worry...I have an envelope liner (and wax seal) to satisfy your sweet tooth! 1. Print the liner of your choice on a sheet of matte photo paper or text-weight paper. (Super thick paper won't fold very well.) Use your high quality (or photo quality) print setting for best results. Note :: Each 8.5″ x 11″ sheet fits 1 liner. 2. Using pencil, lightly trace around your envelope liner template. 3. Cut out the envelope liner. Stick around because I'm about to post a GIVEAWAY! Mother's Day is quickly approaching, and if you haven't had a chance to pop in the store to grab a card, you're in luck. 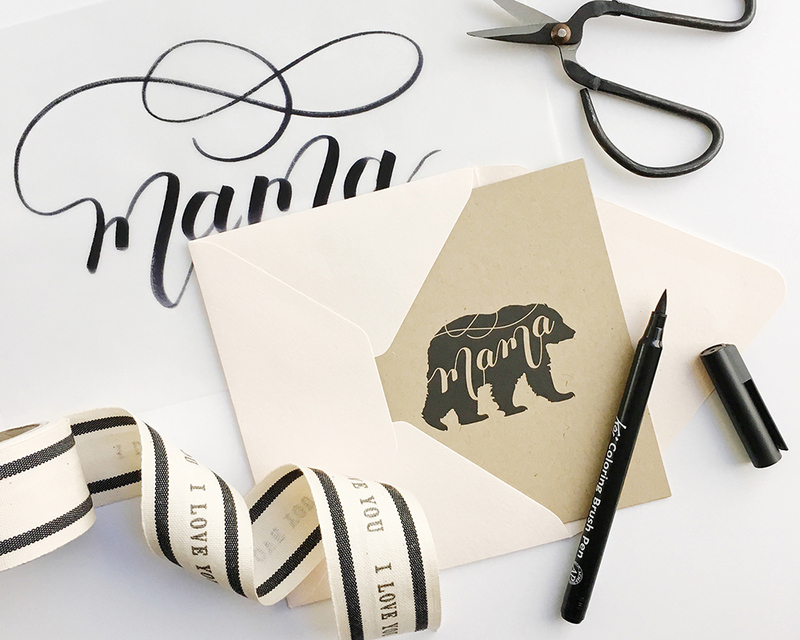 Just download, cut, and fold: 3 easy steps to a hand-lettered card for your marvelous MAMA. Happy Mother's Day to my Mamas, new Mamas, and Mamas everywhere! Can you believe February is right around the corner?! Plan ahead for Valentine's Day this year with my cactus cards! If you follow Akula Kreative (my design studio) on Instagram, you might recognize the prickly plants from several posts back. "Draw cacti" had been on my Do-When-You-Have-Time List for months until I fiiinally had a chance over Christmas to make it happen. Originally, I wanted to use the cactus pattern to make custom fabric for our house—which I still might do—but for now, they work perfectly for printable cards. These small cards are super easy to make: just print, cut, and fold! They fit inside a standard A2 envelope and measure about 4" x 5.125" when folded. The best part is, you have two versions of each design to choose from: one is fully designed and ready to go (top row in the photo below), and the other is plain and ready for stamping (bottom row in the photo below). As always, this printable is free for personal use only and may not be redistributed, copied, or sold. Please share the project with a link to this post. 1. Print the PDF on a sheet of matte photo paper or card stock. Use your high quality (or photo quality) print setting for best results. Note :: Each 8.5″ x 11″ sheet fits 2 cards. The PDF is composed of 3 pages: page 1 is "I love [cact]us," page 2 is "chicks before pricks," and page 3 is "let's cuddle." 2. Using the solid trim lines on the PDF, cut out your cards. If you plan on stamping, I recommend doing that before folding. 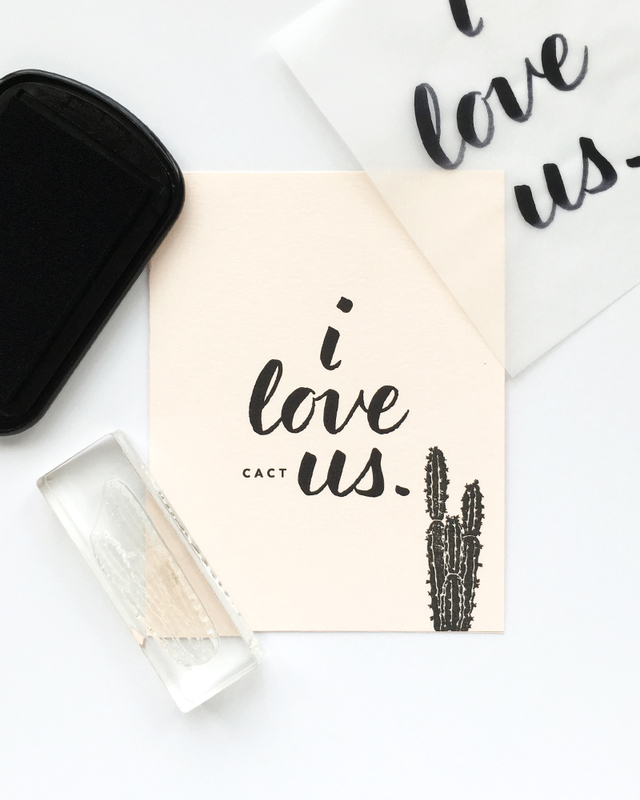 I had SO much fun making these...from the hand-lettered cactus puns to the limited edition stamp set! Oh, and speaking of stamps, I only made a handful of these cactus cuties so you better grab 'em while you can. The set of 3 is $50 and comes with a BONUS stamp! Click here to shop the Etsy Pop-Up. Have fun and hope you enjoy my cacti! P.S. Follow me on Instagram for coupon codes! Free Watercolor Printable | You are loved. There's something you should know :: YOU are LOVED. I lost a good friend this month, and this is what I would say if I had one extra minute with her. As always, this printable is free for personal use only and may not be redistributed or sold. This year's Valentines printable is a modern take on one of my favorite childhood snacks :: Spam musubi (pronounced "MOO-soo-bee" - not "moo-SOObee," Andrew Zimmern). If you're unfamiliar, Spam musubi is a beloved Hawaiian snack made of nori (seaweed), rice, and spam. In my family, musubi is a coveted staple brought to holiday potlucks and birthday parties. The second it gets set down on a table, you can expect it to disappear within ten minutes. Mmmm. Happy Valentine's Day, fellow Pacific Islanders! These miniature cards are a breeze to make: just print, cut, and fold! They fit perfectly in a coin envelope and sit nicely atop a fresh musubi. 1. To make the mini Valentines, simply print the PDF on a sheet of matte photo paper or card stock. Use your high quality (or photo quality) print setting for best results. Note :: Each 8.5" x 11" sheet fits 6 cards; each folded card measures 2" x 3.5". 2. Using the marks on the PDF, trim your cards. Each flat card measures 4" wide by 3.5" tall. 3. Fold each card in half. 4. 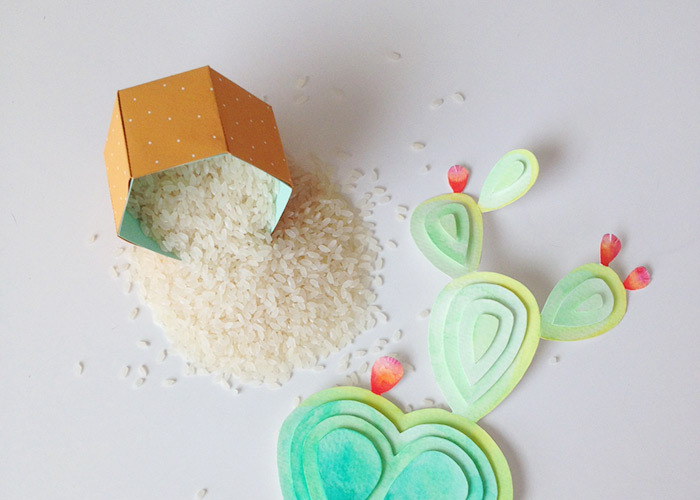 If you want to give the card some texture, use glitter glue to mimic grains of rice. 5. Let dry and stick in a coin envelope. I used glassine envelopes because they remind me of rice paper. :) Seal with washi tape or a sticker. As always, these are FREE for personal use only and may not be copied, redistributed, or sold. The Super Bowl is upon us! These cupcake toppers have been quite a hit on Pinterest, so I've created a new PDF for all you New England fans. The directions are pretty self-explanatory, but you basically download, print, cut, glue/tape. To attach the “foam fingers” to the toothpicks, I just used a small strip of tape on the back. To see more of the toppers in action, check out last year's post HERE. Happy beer drinking and nacho eating! Inspired by our new spineless prickly pear cactus, I decided to try to make a mini paper version for my desk. My watercolor work isn't the best, but overall it's pretty darn cute. The bonus :: it requires no sun and water! 1. Download the PDFs. Print sheet 1 on watercolor paper. (You can also print it on cactus-colored card stock if you don't feel like painting.) Print sheets 2 and 3 on the pieces of card stock you picked out for the exterior and interior of the pot. 2. Watercolor your cactus pieces, then let the sheet dry. Cut everything out, then do a mock-up of the layered pieces. For example: on top of section D, place D-1, then D-2. Use the diagram up there on the right if it helps. 3. Tape the pieces to the main cactus using foam squares. The top pieces are pretty small, so you may have to trim the foam tape a bit. 4. For extra stability, glue a popsicle stick (or card stock remnant) to the bottom of the back of your cactus. Make sure the length of the stick that "pokes out" will fit inside the pot. 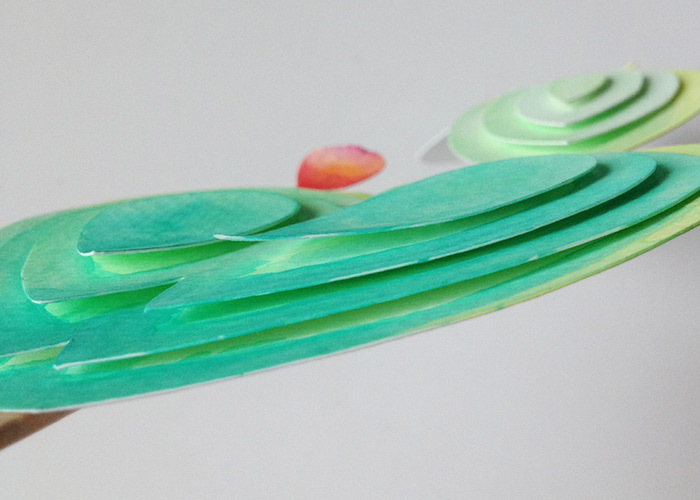 Next, cut out the pot "interior" from your other sheet of card stock. Fold up the walls so you have a hexagonal bottom. Now, place this piece INSIDE the main pot. (It might take some finagling to get it in there.) Secure the two pieces together with double-stick tape. Yay! Now you have a paper pot. 6. Fill the pot with rice, beans, beads, pebbles, or anything else you have on hand...then add your cactus! I did some watercolor touch up once everything was assembled, then bent some of the segments to give it dimension. Looking for ways to impress your Super Bowl party guests? Try our Seattle Seahawks and Denver Broncos cupcake toppers! Just bake up your cakes (like Bakerella's burger cupcakes) and top them with mini "foam fingers" and flags. The directions are pretty self-explanatory, but you basically download, print, cut, glue/tape. To attach the "foam fingers" to the toothpicks, I just used a small strip of washi tape on the back. Or...if you just want a cute Halloween sign to decorate your home or office, print the finished sign you see above. Now that Akula Kreative is up and running again, I finally had a chance to work on a printable. With this project, we can work together to BRING BACK THE CHAIN LETTER!! First, let me explain why I like the idea of a chain letter. None of my good friends lives in the same city. From Africa to Australia, from East Coast to West, I'd need to win the lottery to be able to visit them on a regular basis. Now that Facebook has exploded, we're duped into feeling like we're still in touch, but "liking" a photo here and there isn't quite as special as a letter in the mail. But let's be realistic. As much as I'd looove to spend 2 hours (and $5 in postage) writing notes every day, keeping in touch "the old fashioned way" is hard work. So, I thought of a Chain Letter. But not the crazy kind that guilt-trips you into participating ("You'll die if you don't pass it on!!!"). 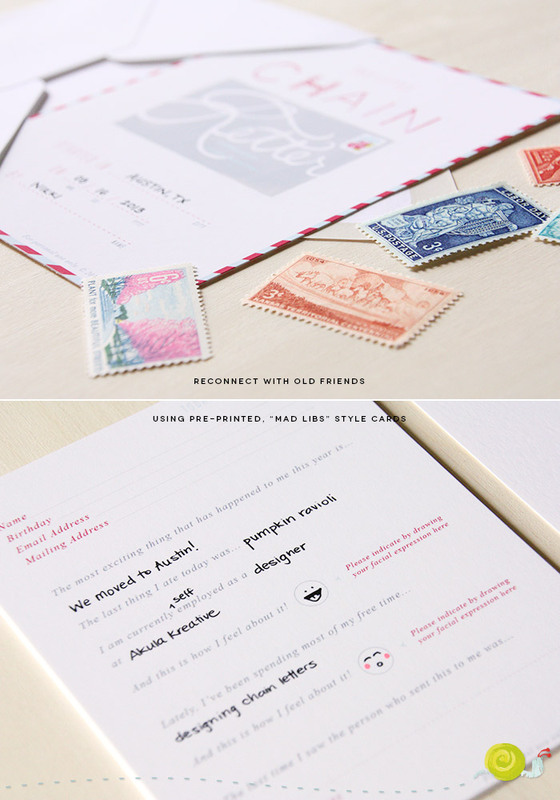 A fun, quick, Mad Libs version that allows you to update friends within just a few minutes. The best part is, you only have to send it one person. Sure, it might take a long time for it to get back to you, but that's part of the fun. The letter is composed of 5 unique pages: a cover page, an instruction page, a map, an info page, and a back page. STEP 1 :: Print one of each page, plus extra info pages (depending on how many people you want to involve). STEP 2 :: Fill in details on the cover page, instructions page, map, and 1st info page. STEP 3 :: Stuff into an envelope and mail to a friend! If you're the one starting the letter, you fill in the cover page yourself. Again, if you're the starter, you get to make up the rules. 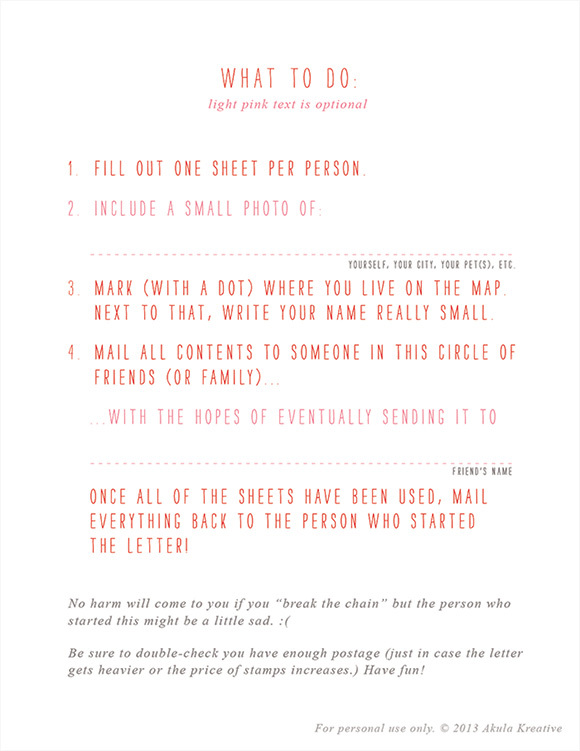 If you want the letters to be sent to a specific group, add a note with names so people know...otherwise it might be fun to just see where it goes. 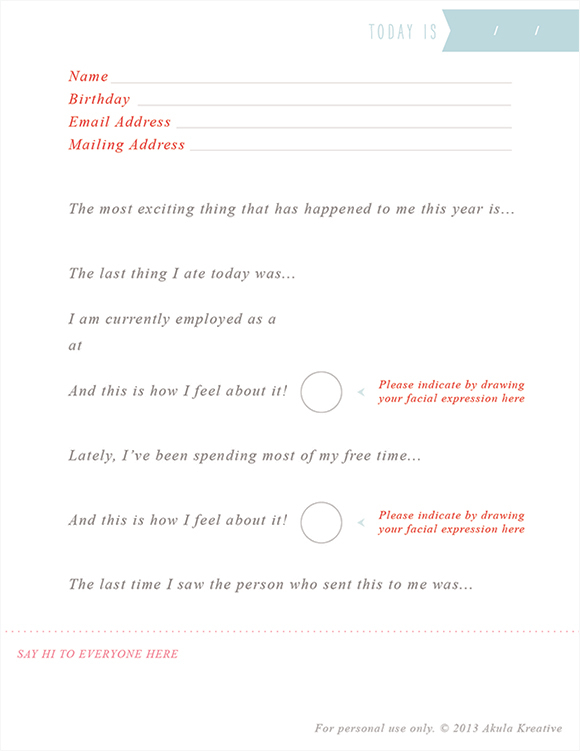 I have a particular friend in mind who I think would love this as a little pick-me-up, so I added an optional section to line 4: "Mail all contents...with the hopes of eventually sending it to [ ]." This way, the second-to-last recipient knows where to send the letter. If the process works, being last is best because you get to read all of the previous answers. Mark your city with a dot, then eventually connect all the dots to see how far the letter traveled. *UPDATE :: A world map and North America map are now available! Please see the link at the bottom of the post to download it. This page will need to be printed several times. If you want to keep the group small, print 4...if you're feeling adventurous, print 10. Print as many as you'd like. If you couldn't already tell, this is the page each person will fill out. There are two things I love about this format: 1) You get to update your contact info and 2) You'll have specific insight into your friends' lives that you'll be able to look back on and laugh at in years to come. Eventually, I'd like to make a few versions of the info pages, so each year I can change it up...but we'll see how this round goes first. If you have any requests for other versions designed for kids, pen pals, other countries, etc., tell us on Facebook or comment below. Oh, last thing. If/when the letter returns to you, you can take photos or scan the contents and email them to everyone. In theory, I think it's a great way to encourage everyone to keep in touch. You can even use social media to keep track of where the letter is. I mean, come on...how fun would it be to open something like this in the mail??!! To join in, you can download the printable files for free below! Each page measures 4.25" x 5.5" - depending on the number of sheets you include and how thick your paper is, they'll fit in an A2 envelope or larger. We recommend using high quality paper and the "best photo" settings on your home printer. The second PDF includes 4 info sheets per page. Print as many as you need. *Free for personal use only. These PDFs may not be copied, redistributed, or sold. If you download our free templates, we’d really appreciate it if you liked our Facebook Page! It’s a great place to find news about promos, coupon codes, and giveaways! Finally getting around to posting another freebie! With this PDF you can print 8 gift tags per sheet (4 of each design). They're the perfect finishing touch to a nautical-themed party gift! ...Then print it on high quality matte paper, punch a hole, and thread your ribbon or twine. Enjoy! *Free for personal use only. This PDF may not be copied, redistributed, or sold. a small dry erase board :: you can find these almost anywhere: office supply stores, craft stores, amazon.com, etc. Open the PDF, then print it on an 8.5" x 11" magnet sheet. Let dry for a few minutes to make sure the ink doesn't smudge. Trim the pieces. I recommend: a) using a paper trimmer if you have one, and b) trimming the table in rows instead of cells. This will make things a lot easier. Optional :: I used the extra space on the magnet sheet to print out some vacation photos. If you don't use them on the board, you'll have extra magnets! Ta da! A fun, easy-to-make interactive travel board. If you have any questions, feel free to comment below. Please remember this is free for personal use only. After downloading the PDF, print it out on full sheet label paper. (Avery full-sheet labels work great - you can buy them at any office supply store. Our favorite label paper is Spectacle InkJet Crack and Peel from sheet-labels.com.) Each sheet will provide 3 wrap-around labels, each approx. 3.5" x 6". Cut out the labels with a paper trimmer, leaving a 1/4" border around the blue pinstripe. Stick 'em on to your 5" x 7" photo mailers!